When George Garrett arrived at the University of Virginia in the spring of 1962 and scheduled a creative writing class, I had lost my academic scholarship and my plan to go to medical school. Two years of illness after surgery to save my right leg and an undiagnosed case of mononucleosis had left me in a perpetual state of fatigue. No one can pass Organic Chemistry in that condition. The only encouraging event in that disastrous second academic year was my term paper for the course in American Literature. I rejected the topics suggested in the syllabus and asked the professor, Rex Worthington, if I could improve on Ernest Hemingway’s novel The Sun Also Rises by writing an additional final chapter. He attempted to dissuade me by saying, “If you pull it off, it’s an A. If not, it’s an F.” The paper was judged an A, and Rex told me that I was the first potential novelist that he had ever seen in his classroom. So the following term, when George Garrett was holding interviews for admission to his creative writing class, I signed up. Coming into George’s circle as a student and friend altered the direction of my life and set me on a course to produce over fifty major works of literature. George was the master of inclusivity when other literary lights tended to form exclusive intellectual clubs. It has been documented by R.H.W. 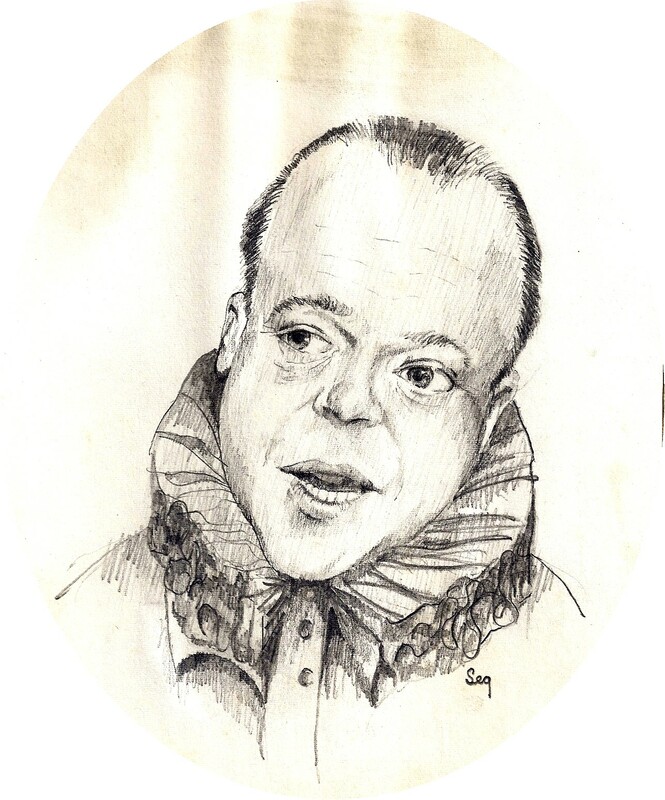 Dillard and many others that George Garrett is “a widely beloved and revered figure.” As a literary artist, George never repeated himself in a breadth of talent that seemed to befuddle critics who could not conveniently classify him. In 11 novels, 8 short-story collections, 8 poetry collections, and 8 non-fiction books, George Garrett proved himself to be one of the best writers of his generation and an enduring resource to all who follow. In 1963, as a writing class project, George edited New Writing from Virginia, a small-volume anthology with an Afterword by Richard Wilbur, that was the first book publication for more than a handful of writers who went on to have notable literary careers. I became the principal agent for the details of the publication. I remember that Henry Taylor and I went to tea at an extravagant horse farm estate outside of Charlottesville to solicit funding for the project. George, I guess, bore the costs of whatever we failed to raise. When New Writing from Virginia was published, Bob Friedman (who went on to have a significant career as a publisher) and I presented copies to University President Edgar Finley Shannon, and an official photo was taken. Copies of New Writing from Virginia are now valuable collector items. The story of how George employed Henry Taylor and me as audience shills for readings by William Faulkner is told in an earlier blog posting. George later assured the publication of Henry Taylor’s first book of poems, The Horse Show at Midnight in 1966 by withdrawing an already accepted manuscript of his own poems when the LSU Press had room for only one more book that year. In 1986, Henry won the Pulitzer Prize for his poems in The Flying Change, also published by the LSU Press. Each of us who had the benefit of mentoring by George Garrett has favorite stories to tell; and in 2003, a three-day literary festival was held at the University of Tennessee in Knoxville to celebrate the man and his literature. I was there as a witness, and afterwards I wrote a reflective piece that I want to share as my tribute to George Garrett who died at the age of 78 in May 2008. The David M. Rubenstein Library at Duke University houses the most extensive collection of Garrett’s manuscripts and letters. Literature is a high expression of the Divine attempting to know itself. For life to know itself, to have awareness of itself, the mind was evolved into being. The fine arts are thus the expressions of priests devoted to the recognition of the spiritual connections in all life forms. The seeming obsession is that artists are laboring desperately to know themselves, and that they are willing to make great material sacrifices in these acts of discovery. Among those who are biologically driven to do this work of understanding, a precious few achieve the insights for which they were intended; and if we, the greater body of humanity, chance upon them, we are enriched and made more able to do the work for which we are intended. This is the Divine plan—that we serve each other in the experience of living. George Garrett serves us, the cognizant humanity, in an exceptional body of work that elevates our awareness of what it means to live, to observe, to care, and to act with compassion. Great literature should instruct us in the virtues of compassionate awareness and alter us to a better service of our hearts and minds. We can ask no more of any co-creator of our universe except that he or she enlighten us to the nature of our own being, and it is for this personal, uniquely meaningful sharing of insight that we owe our respect, our gratitude, and the return of a loving embrace. For great literature does indeed embrace us like a true, unselfish friend. In more ways than all the books he has authored, George Garrett is our true friend, our mentor of self-awareness, our spirit guide; and with great courage, he has fulfilled the gift of his talent, met the requirements of Destiny, and achieved everything that any human being and artist should aspire to: the reciprocal love of family and friends and the genuine respect of peers and readers. George Garrett causes us to have the realization that service to our common humanity is still the best work of life. On three days in early October of 2003, a festival was held to celebrate George Garrett, and it was like a tent revival meeting where no souls were lost, and the congregation went out—all of us—into the crisp Knoxville night joyfully happy and convinced of our mutual salvation. Thank you, George. 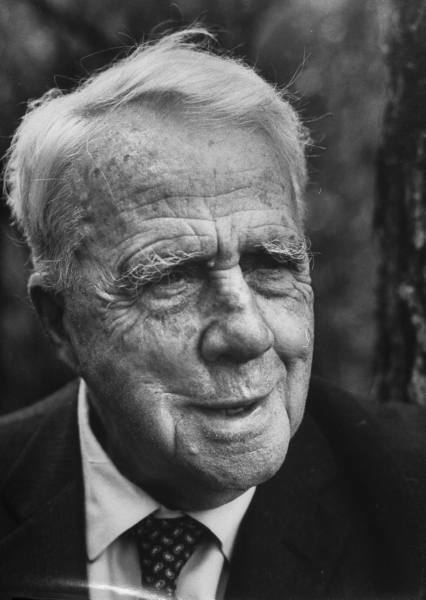 In 1960, when I was in my second year at the University of Virginia, poet Robert Frost came to the Grounds for the dedication of the Clifton Waller Barrett Library of American Literature that had assembled the most complete collection of Frost’s works ever brought together. There was an elegant dinner at Carr’s Hill, the U.Va. president’s mansion, followed by what was expected to be a brief appearance by Frost at Cabell Hall auditorium. I must have had some ushering responsibilities that night, because I arrived early and secured prime seats for myself and my roommate Ted Wolfe, who carried a volume of Frost’s collected works that he desperately wanted autographed. The auditorium filled to capacity, and then the student overflow was allowed to occupy the wings of the stage where, grateful for their surprise positions, they sat shoulder to shoulder on the hardwood floor. My duties done, I took my seat next to Ted and waited for America’s most awarded poet to arrive. The reason I so warmly embrace Frost’s inauguration triumph over physical vulnerability and potential humiliation is because I had witnessed his amazing strength that night in Cabell Hall. I forget who introduced Frost. In memory, I see him enter the stage from the wings on the arm of a black man dressed in what appeared to be a chauffeur’s uniform. The students seated on the floor slid on their behinds to make way. At the podium, Frost had three worn books of his collected poetry. I had been told by one of the stage managers that Frost would speak for no more than fifteen minutes. And how could he be expected to do more after such a long ceremonial day? Looking at the old white-haired man bent with age, I guess most of us in the audience expected the reading of a few poems and nothing more. Certainly there would be no question and answer period that we had come to expect from our on-Grounds writer-in-residence William Faulkner. Frost removed a folded sheet of paper from his inside suit coat pocket, considered its content, and then returned it to the pocket. He had not said a word, and the audience paused in suspended animation for what he might do next. Then in a very gentle, conversational voice, Frost recounted how he had leaned back during the limousine ride to the auditorium, and through the curved rear window, observed the evening star. He said that seeing it reminded him of how important the evening star had been in his poetry, so he decided to put away his prepared remarks and read a few of the poems inspired by that star. He then began to search through the three books for the poems that came to mind, and a remarkable transformation began to occur. As he read, his posture became more erect, his voice stronger. And although he began reading a poem from an open book, by the second or third line, his eyes came up, and he was reciting from memory. Oh, my God, the poetry came alive in an experience of profound revelation. The familiar ones like “Mending Wall,” “The Road Not Taken,” and “Stopping by Woods on a Snowy Evening” were never so wonderfully satisfying, and all the others so attuned to our youthful souls. Frost astounded us with his strength as a lifetime of creative energy welled up in him. And then, with the last poem recited and more than an hour passed, his gigantic aura receded, and his body slumped back into its previous form of old age. In awe, even as we stood and applauded, we saw him helped across the stage as one might support an invalid. Ted grabbed my arm and begged me to take him backstage where Frost might autograph the book he had brought. When we got near to Frost, he was still being supported by the same man in the uniform as they made their way toward the exit. Considering his vulnerability, I was very reluctant to bother Frost for an autograph, but Ted insisted. Imagine my audacity as I introduced Ted to Frost and asked him to sign Ted’s book. Frost only mumbled, and with a trembling hand and stub-nosed pencil, he scrawled something almost illegible onto the title page of the book. Seeing Frost backstage, it was impossible to believe that this was the same man who had held an audience spellbound for over an hour. We could only rationalize that what we had witnessed was a divine expression of the creative life force. Then, later at Kennedy’s inauguration, we saw the power again, and perhaps we wept at the natural wonder of a creative man like Robert Frost. I first saw and heard William Faulkner just as many second-year men at the University of Virginia did during a question-and-answer class set up to discuss his novel Light In August, which was standard American Literature course material in 1961. Joseph Blotner, the U.Va. English professor who was to become Faulkner’s official biographer, introduced the world-acclaimed author with few words and took a seat. Faulkner rose from his chair and stood at the lectern, slowly surveying four tiers of students who sat in a semi-circle around him. What the students saw was a 64-year-old small-framed man with white hair and a thick mustache. There was an embarrassing silence as Faulkner made no introductory remarks, but waited for the first question. Finally, someone had the nerve to ask one. If we expected the roar of a lion tamer’s voice, Faulkner’s soft Southern tenor with its almost prayerful intonations was a surprise. So, too, were his responses to long, complex literary questions about dark symbolism and such. His constant position was that he was just a farmer who liked to tell stories about the struggle of the human heart. My personal introduction to the writer whom we U.Va. 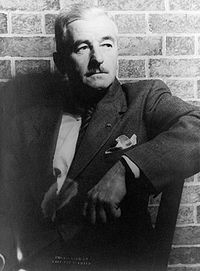 types referred to as Mr. Faulkner, just as we referred to Thomas Jefferson in the present tense as Mr. Jefferson, was made by George Garrett who started the creative writing program at U.Va. in 1962. 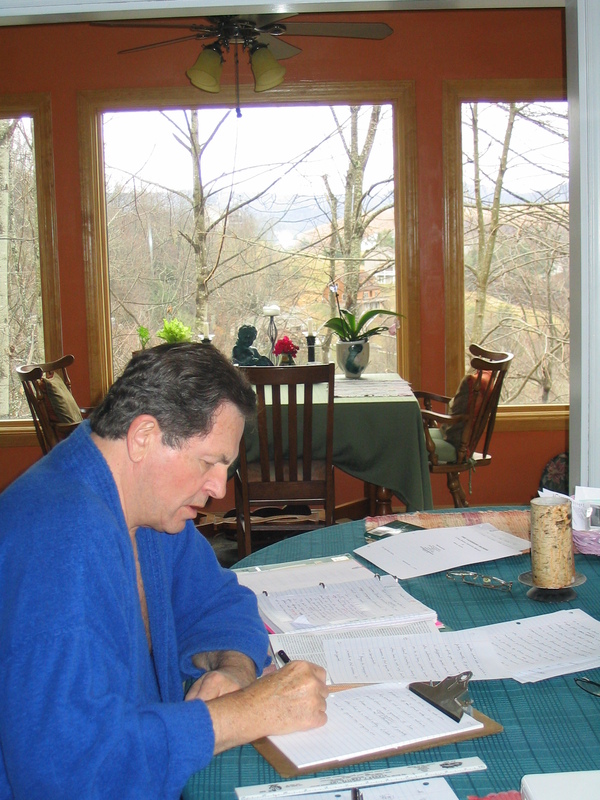 George is the revered and widely beloved mentor to a thousand writers like me. George wrote at such a level of high quality in so many literary genres that no critic could fathom or contain him. He never repeated himself in fiction or in poetry and was thus a true original. His unparalleled generosity to students was demonstrated when he asked Henry S. Taylor (who was to win the 1986 Pulitzer Prize for Poetry) and me if we wanted to have coffee with Mr. Faulkner. As the writer-in-residence, Mr. Faulkner had office hours for conferences on the fifth floor of Cabell Hall, but few people were advised of them to prevent him from being bothered by autograph seekers. George would check his watch at the end of Mr. Faulkner’s office hour, and we would walk down the hall to see if the great man wanted to join us for coffee in the Old Cabell Hall “cave” which was mostly empty that late in the afternoon. Usually, we would find Mr. Faulkner dressed like us in sports coat, button-down collar shirt, striped tie, and khaki pants, sitting behind his desk reading a book. Our conversations over coffee were far from literary, although Mr. Faulkner did tell us that the death of Ernest Hemingway was suicide and not an accident. Mostly, we talked current events and university sports. Mr. Faulkner was an official timer for the U.Va. track team, and he was an avid horseman. One day he told us that he had received an invitation to attend a luncheon at the Kennedy White House but that he wouldn’t go. Washington seemed too far to go for lunch. He must have repeated that comment to a reporter because the next day it appeared in the New York Times. Mr. Faulkner in conversation often used an extremely subtle form of double-entendre. Often the surface meaning was humorous and its secondary meaning surprisingly deep and well conceived. Henry Taylor and I used to replay Mr. Faulkner’s coffee talk and try to unravel the layers of meaning in what we had first taken for casual remarks. Sometimes we recognized intellectual spins that went beyond three or four associations. Did Mr. Faulkner think that deep? The spring of my third year at Virginia saw the publication of Mr. Faulkner’s last book, The Reivers. At the Corner off grounds, a few hundred hand-signed and numbered copies sold for $10 each. I never saw Mr. Faulkner sign any editions of his books when offered for autograph. He signed no books except those arranged by the publisher for special sale and those he inscribed for personal friends. I never imposed on him to sign anything for me. Mr. Faulkner read the horse race scene from The Reivers. Part of the text was in dialect; and on the whole, he read well and with some feeling, although his voice was not very strong. When the reading ended, there was prolonged applause, and then Mr. Faulkner stood mute as was his custom. My moment had arrived, and from the podium he recognized my raised hand with a nod. My question was one that I had asked before at other readings, and George suggested that I use it for this event. The old gray fox smiled for perhaps the first time that afternoon. That summer, Mr. Faulkner died at his home in Oxford, Mississippi as a result of complications from a horse-riding accident. I can still see Mr. Faulkner pause, smile, and answer my movie question. And I will always smile back because he knew that I knew that he had written the screenplay for Sanctuary, adapted from his novel, and that he had done other movie work in Hollywood for Howard Hawks. Mr. Faulkner, all kidding aside, knew the movies.